In the early 1970s the only successful way of controlling termites was by spraying chemicals which are no longer on the market. Today, thanks mainly to the work of John French, the alternatives are not only safe for us and the environment, they focus on getting rid of the problem. John French had studied Forestry in Aberdeen, Scotland and Forest Entomology in the University of Sydney, before acquiring his PHD at the Oregon State University. In 1972 he joined the CSIRO (Commonwealth Scientific and Industrial Research Organisation) Melbourne, in the wood division. Shortly after he started, a nurse, who had a son with leukaemia, called needing to get termites out of her house without using chemical sprays. This was the impetus that started John looking for non-toxic solutions to termite problems. John has spent a great deal of his time with the CSIRO developing and refining his method of termite control through baitboxes. In 1989 he went to America and shared his knowledge. From that visit a lot of the new termite baiting systems have been developed. 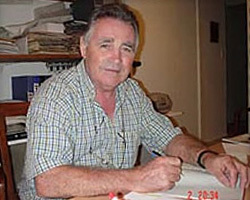 Robert Cameron of SA Pest Free Naturally, first met with John in Melbourne at a workshop John was giving on the control of termites through bait boxes on 11th November, 1996. Robert was extremely impressed with John’s work and came back and started practicing this form of termite control in the field in Adelaide. Robert and John have kept in contact ever since, sharing information and findings on termite control. Through this association, SA Pest Free Naturally has developed the John French System of Termite Prevention and Eradication. Area inspection – the house surrounds are searched for termite activity and colonies. Venus Termite Traps – placed strategically around the building to warn of termite activity in the area. Colony Eradication – Depending on whether or not the colony can be found it will be directly eradicated or controlled through traps. As John French continues to further research and develop termite eradication, the process and systems will continue to evolve and improve. Robert Cameron of SA Pest Free Naturally, is committed to continued testing and improving of the systems used by SA Pest Free Naturally to protect and eradicate and control termites for the benefit of his clients’ homes, their health and our environment.